OF home with magnificent sunsets, beach and amenities, Close to Wailea. One bedroom, two bath oceanfront home on a sandy beach and viewing west for the magnificent evening sunsets. Recently remodeled kitchen with bamboo cabinets, new appliance and high end cookware and dishes. Owner must be contacted prior to booking if more than 12 months in advance. A/C is available in the bedroom for a $15 a day energy surcharge that is not noted on the rate sheet. May to November are warm months. Dual king bed in the bedroom with ceiling fan. A/C is available for a $15 day energy surcharge. Warmer months of July through October make the A/C very welcoming. Home was updated in 2011 with new kitchen, paint and upholstery. The master bedroom has an ocean view and a California King bed. There is A/C available in the bedroom for $15 a night. We have ceiling fans in the bedroom and a 46 inch flat screen TV, cable and DVD. There is a safe for valuables and an adjoining bathroom with a large walk in shower. The floors are tile. In the living room there is a Queen sized Murphy bed, ceiling fans, ocean view, 46 inch flat screen TV, DVD and iPad docking station. There are ceiling speakers from the tuner and also speaker out on the lanai to enjoy your favorite music. A bathroom adjoins the living area with a large walk in shower. The kitchen which has been completed redone has bamboo cabinets, all new major appliance, and lots of cookware and dishes. My Waii has a slow cooker, rice cooker, electric fry pan, coffee grinder and believe or not sharp knives. We have a full size washer and dryer and there is a wonderful clothes lines for drying swim suits and beach towels. There are beach chairs, beach mats, beach towels and an assortment of beach toys, flippers, etc in an outdoor shed. On the lanai there is a great Weber gas grill and we have an extra tank of propane should you run out. There is outside dining for four along with four chaise lounges.Of course there also are those outdoor speakers from the stereo system for your enjoyment. The yard is quite expansive towards the ocean.and the beach in front is sandy and excellent for swimming, sunning, a little snorkeling, stand up paddling and surfing, if the surf is up. All of the beaches in the state of Hawaii are public so there will be others enjoy the beach in front. That is Hawaiian style. We provide all of the cleaning material, dish soap, laundry soap and all paper products. Maid service is before and after your stay but should you wish to have maid service you can work directly with the housekeeper for an additional charge. You would pay her directly for that service. Parking is on the street. My Waii is located on a residential street just off of the South Kihei Road. There is a little noise on Tuesday and Friday morning early as the garbage trucks come down the street about 6am. My Waii is within walking distance of groceries, many restaurant and all sorts of shopping areas. Starbucks is close by if you can't live without That Starbucks fix. Within minutes you are at Wailea with the upscale Shops at Wailea that hosts the Wednesday WOW! music and shopping. Wailea also has lots of golf and tennis. But if you are a tennis player you may also play at Kalama Park which is within 5 minutes at no cost. It is a lot of fun to play there as you meet folks from all over. Upon final payment our instructions will provide the on-island manager's name and contact information. We do not accept bookings more than than 12 months in advance. Over 30 years as a 'Hawaii Only' travel agent. Love the islands. My parents bought this property in the early 1960's and I have managed it since the beginning. Both parents gone now and this home and a larger one next door are owned by four siblings. My Waii is a wonderful small home directly on the ocean with all the amenities needed. We enjoy a large yard and a sandy beach directly in front of My Waii. Good for sunning, swimming, surfing (if the surf is up) and even snorkeling. My Waii is continually being upgraded to meet the needs of all guests. It is wonderful for weddings, honeymoons, couples and families. There are so few small oceanfront home still available for rent on Maui. Most have been torn down and big mega houses built. Come and enjoy the most magnificent sunsets. You seldom can experience the sun dropping behind the ocean each evening. Reasonable, well maintained, darling, great beach, nicely appointed. A very special accommodation on the south shore of Maui. How often can you find a small home directly on the ocean at a reasonable price. Many of the smaller homes are now mega homes, you will enjoy My Waii, Very seldom do you find a free standing small home directly on the ocean facing west. My Waii has all the amenities of Complimentary wi-fi, cable TV, free calling to any point in US or Canada along with a iPod docking station. We have speakers inside and out of the lanai to enjoy the music of your choice. If you enjoy water activities My Waii is perfect. Great swimming, good snorkeling, body surfing, stand up paddling, regular surfing is all here with out leaving the property. We supply beach chairs, mats, beach towels along with miscellaneous beach toys. You are within walking distance of a grocery store, Starbucks and several restaurants. You are close to Wailea where there is top of the line shopping and excellent restaurants. Each bathroom has hair dryer and all soap kleenex and toilet paper are provided. Master bath completely remodeled June 2018 but I do not have pictures loaded yet. Very nicely done. This small intimate beach is perfect for sunning, snorkeling, swimming and enjoying. Beach towels as well as bathroom towels. We ask that bath towels not e taken outdoors as they bleach out. flippers, snorkels, etc, not the best but will work. Nice equipment can be rented in near-by dive shops by the day or the stay. Surf boards and surfing lessons are available within 5 minute walk. Kalama Park, 5 minute walk 4 free courts. Wailea Tennis Club 15 minute drive very good rates and they will set up matches. Many golf courses very close. Twilight golf start shortly after noon. We have been to Maui many times and found Linda's cottage for this year's run at paradise. It is everything the pictures show and more. When you stay at a place that you really don't want to go away from, even to do other activities, then you have found yourself a little home away from home. Can't say enough about the view, beach, waves, golf green grass and all the amenities you would need for a special stay. Thanks Linda and Barry for being there for us when needed; like hardly ever needed. :) Love you guys and love "My Waii"! Well maintained, quiet beach front cottage away from most traffic noise on a section of beach few people ever visit. thank you so much for taking the time during this busy holiday period to review the My Waii Beach Cottage. Everything about our stay was amazing. The property was everything advertised and more. I cannot think of a thing that wasn’t provided, even down to binoculars, beach chairs, books, games, snorkels, fins, boogie boards, beach towels, and movies. The was was spotless. We didn’t have to do a thing but enjoy. We were there during Hurricane Lane and the property manager made sure we were all right. She even said if the storm became a threat she would come and pick us up to stay at her place. We had our wedding on the property. Initially it we were going to another beach to have it but could not find a site more beautiful than where we were. We certainly will return and stay here. Looking for anything better would be futile. That you for the review of your stay and we hope you will return in the future and take advantage of our 5% returning guest discount. Very well maintained home & close to everything! Definitely a nice place, close to everything. The beach was fantastic! Thank you for the nice review and we hope you will return some day in the future. This home is amazing. It’s steps away from one of the most amazing beaches in Maui. We kept finding ourselves wanting to explore but nothing beat being at home base at the Waii. Highly recommended. We also absolutely loved Kihei, what an amazing place. Location, house, amenities are all perfect!!!! We are so glad that you felt that the My Waii Beach Cottage was the perfect small beach front home and property. Kihei is lots fun, hard to go out and about when you have all right there, keep it local as they say. We look forward to a return visit in the future and we give our returning guests a 5% discount. This place was everything we hoped it would be! Perfect location. Everything we needed was in the house. Loved it. Will be returning at some point! We love the fact that you can walk to Foodland for groceries, walk to dinner and enjoy the beautiful oceanfront walk in front of the Kalama Park. 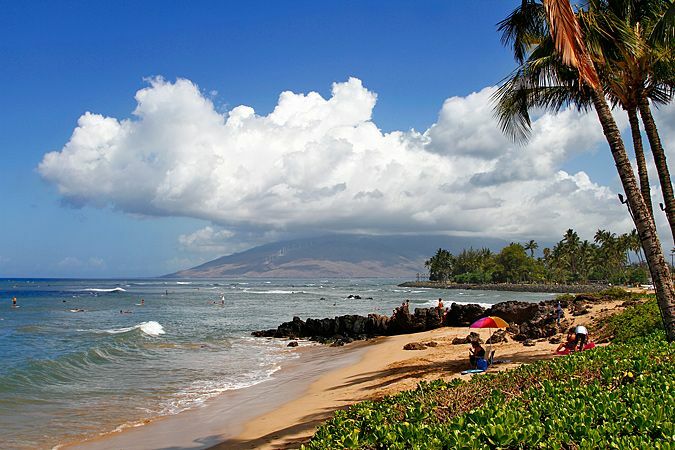 Fabulous beaches in south Maui to visit. So many golf courses, public tennis courts at no fee at Kalama Park, basketball court and big toy.=, amazing. There are local restaurants with plate lunch specials, mid range like Cafe O'Lei, gourmet like Quatro, Gannons, Mateos and many more. Just use your smart phone for Yelp for Maui Dining and enjoy so much so close by.